Sandwiches are considered a kind of main diet consumed around the globe! they are a simple pair of slices with an imaginative filling of your choice(of-course only right ingredients put together makes great sandwiches)when talking and thinking about sandwiches can we avoid the “sandwich-wallahs”of Mumbai streets supplying this snacky delight right from morning till dawn!never.These vendors have a magical art in their hands transforming humble international sandwiches into Indianised version! and not measurably Indianised of-course it’s all combinations of various cuisines in them like Chinese,American to name a few.These Indian sandwiches as a whole is fulfilling and alluring with a huge variations and innovations making addictive and attractive by all means with good addition of Indian chutneys to it. Here I have done chutney sandwich with addition of some vegetables to it and have lightly sauteed the veggies to get rid of rawness but maintaining the crunch and crispness of the vegetable . I have adopted this recipe from sanjeev kapoor’s you tube video. 1.Keep ready with all the items. 2.Keep a kadai add some butter add onions and capsicum saute for a minute and take in a bowl. 3.Then add cheese and chutney to it and mix well. 4.Then add some sweet corn and mix. 5.Heat a panini grill and add butter to the grill. 6.First butter two slices of bread. 7.Keep the filling inside the slice close with another. 8.Butter the upper side of the slice(grill is already buttered). 9.Then keep it in the griller and close. 10.After few minutes your sandwich is ready. Keep ready with all the items. Keep a kadai add some butter add onions and capsicum saute for a minute and take in a bowl. Then add cheese and chutney to it and mix well. Then add some sweet corn and mix. Heat a panini grill and add butter to the grill. First butter two slices of bread. Keep the filling inside the slice close with another. Butter the upper side of the slice(grill is already buttered). Then keep it in the griller and close. After few minutes your sandwich is ready. You can add other veggies like tomatoes and boiled potatoes. If you don't like capsicum you can add more of sweet corn instead. Tamarind sauce can be had as a dip for this sandwich but it tastes great as such. 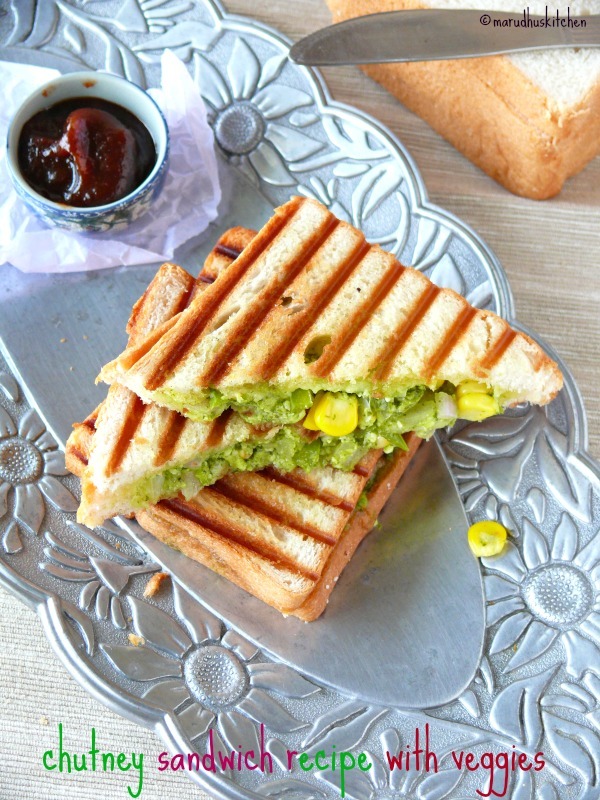 You can use a toaster,griller or even flat dosa pan is fine to do this sandwich. You can use any kind of cheese of your choice. Fast Casual Foods of India: Who Will Wrap It Up in America? 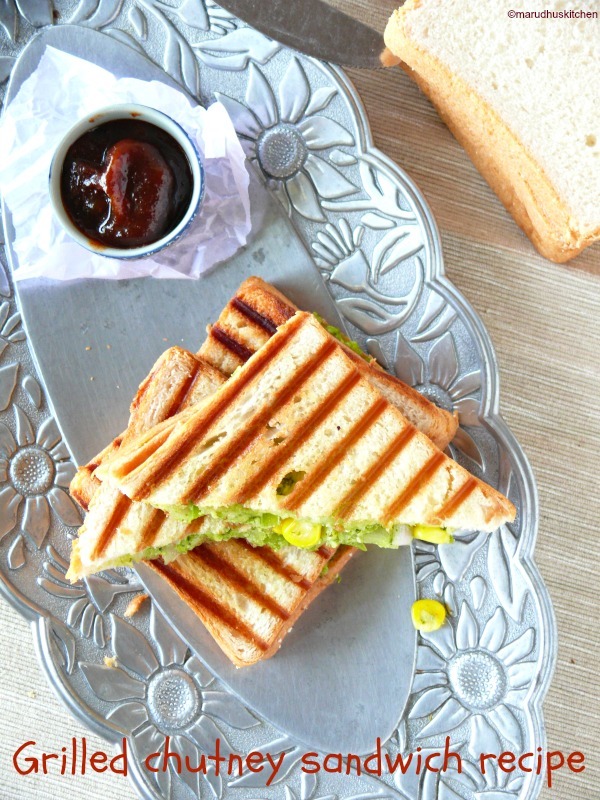 Absolutely loving this grilled chutney sandwich! So inviting and YUMMY! Look at the pictures, just Wow… Absolutely yumm and delicious. 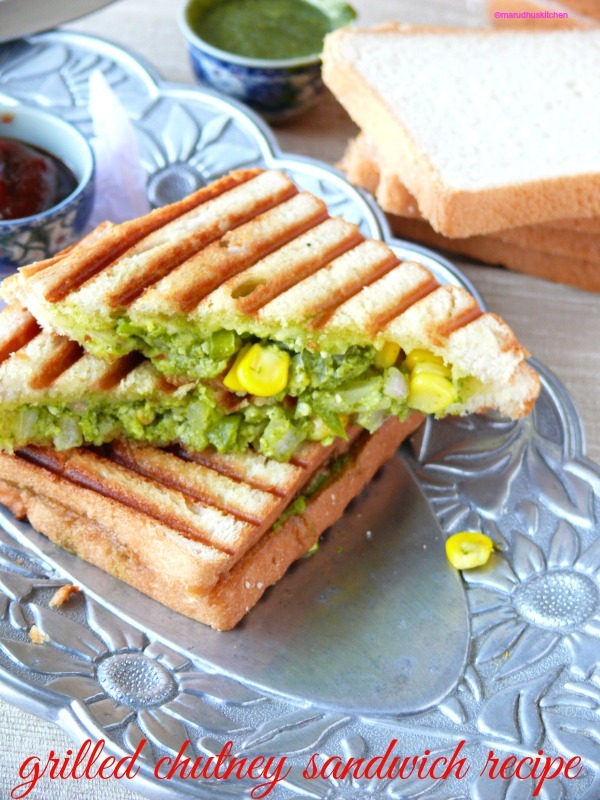 Super yummy chutney sandwich….Love to have it right away with a cup of coffee!! simply superb.. wish I could grab a piece. Chutney sandwich looks too tempting! Yummy chutney sandwich!! Drooling here!! Delightful grilled sandwiches Vani, loved them and your chutney looks tasty.